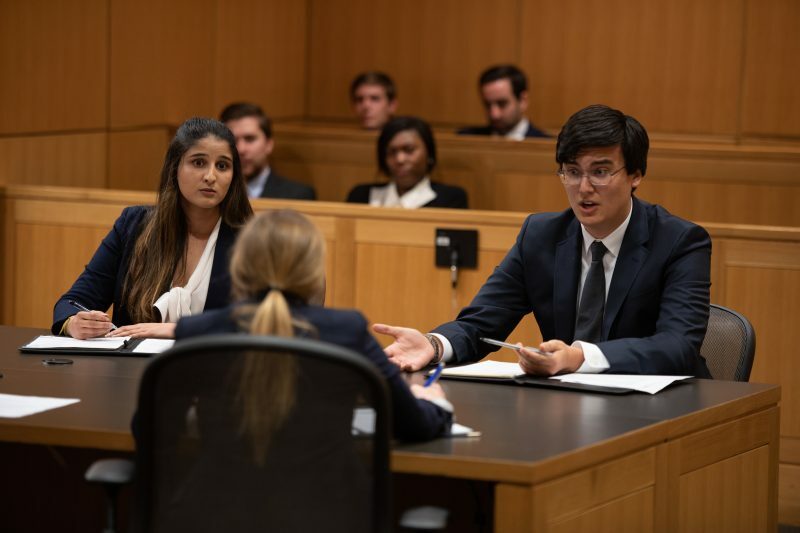 A busy fall season of intra-school moot court events concluded this week with the finals of the Mock Trial competition. 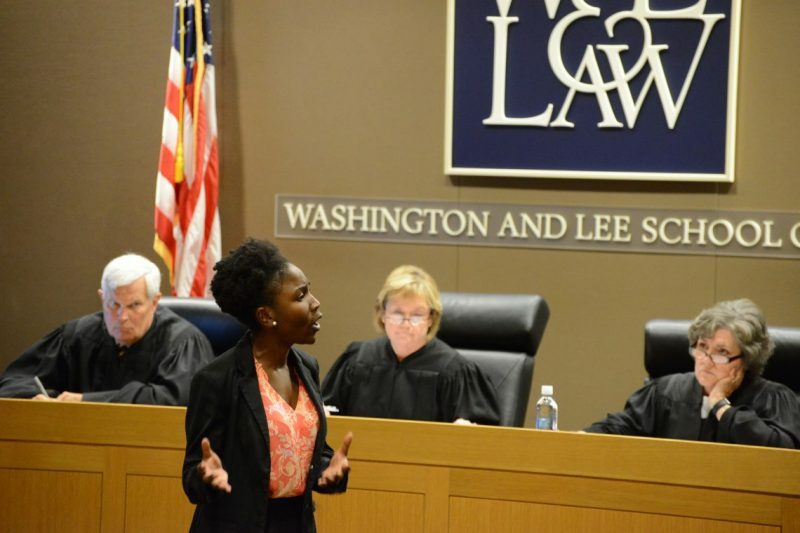 In addition to two more school-based competitions, W&L Law teams will now gear up for external competitions at the regional and national level. The team of Brandon Howell ’20L and Kaya Vyas ’20L won the competition. Lee Sands ’20L and Austin Scieszinski ’20L were the runners-up. Also competing in the finals were the teams of Mahalia Hall ’20L and Jessiah Hulle ’20L and Elizabeth McLellan ’20L and Grant Cokeley ’20L. The competition was judged by Robert J. Grey, Jr. ’76L, Andrea Wahlquist ’95L, and Alvin Brown. 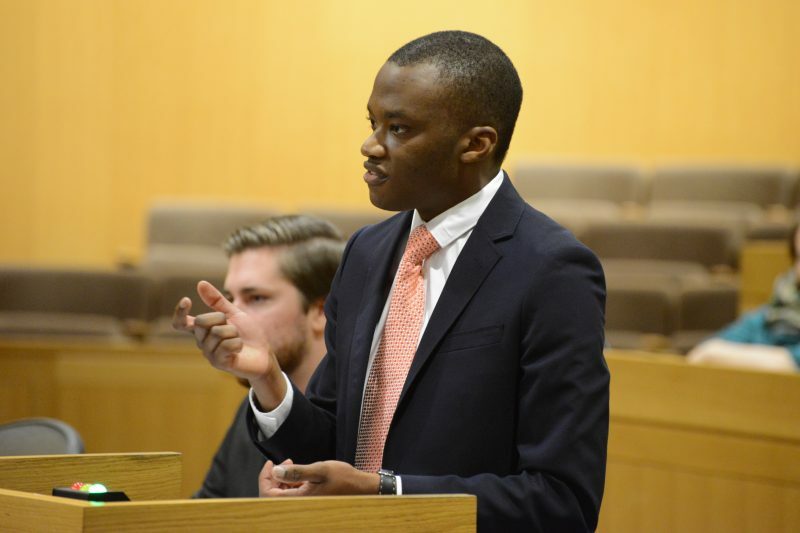 Junior Ndlovu ’20L took first place in the oral advocacy competition and Bonnie Gill ’20L won for brief writing. Robert Wilson ’19L finished second in both the oral and brief writing competition. Others competing in the finals were Jessiah Hulle ’20L and Joe DuChane ’19L (oral advocacy) and Shelby Brooks ’20L (brief writing). Judges for the competition were the Hon. Rossie Alston, Jr. of the Virginia Court of Appeals, the Hon. Mark Davis ’88L of the Eastern District of Virginia, and the Hon. Amit Mehta of the District Court for the District of Columbia. Natey Kinzounza ’20L was the competition winner, with Robert Wilson ’19L finishing as runner-up. Austin Cano ’20L and Kathy McLaughlin ’19L also competed in the finals. The judges for the competition were the Hon. Elizabeth Dillon (United States District Court for the Western District of Virginia), the Hon. Charles Dorsey ‘79L (23rd Judicial Circuit of Virginia), and the Hon. Anita Filson ‘82L (25th Judicial Circuit of Virginia).